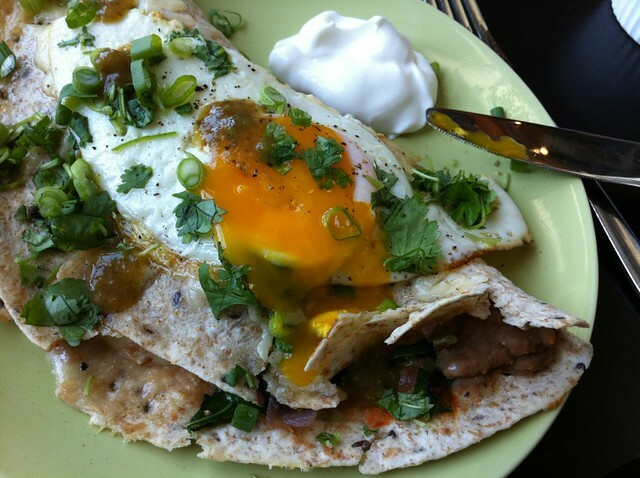 Ok. You know how I like Tex Mex breakfast… well, I’ve gone and done it again. This time I’ve made “Huevos Mildred” — kind of like huevos rancheros, but inspired by the Huevos Monty at Mildred’s Temple Kitchen here in Toronto. Mildred’s classic black bean refritos & sharp cheddar cheese baked in flour tortillas and topped with eggs sunny, fresh salsa & avocado crème fraîche. And so for my version, I’ve come up “Huevos Mildred” — a tortilla filled with refried beans, onions & collard greens, and fresh red chilies, topped with old cheddar, a sunny-side-up egg, and some green onions & cilantro. I like to serve this brunch with yogurt, guacamole, and extra salsa — go for whatever toppings float your boat. 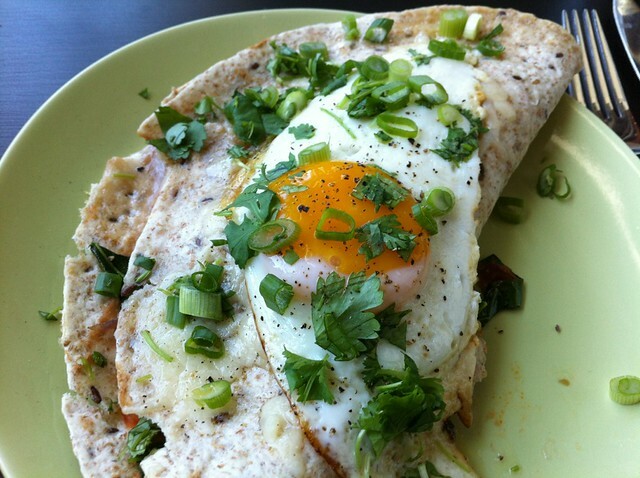 For hungry eaters, I like to use two tortillas filled with all the good stuff and topped with two eggs so you get a round shape. You can see here that I did the lighter eaters version: one tortilla, stuffed, then folded in half and topped with one egg. Whichever way you do it, enjoy! Preheat the oven to broil, and prepare a baking sheet by lining it with aluminum foil. In a large pan over low heat, sweat the onions and garlic in the 1 Tbsp. oil or butter until translucent. Add the salt, collard greens, and chilies, and saute for 3-5 minutes more, until the collards are bright green and slightly softened. Fill each tortilla with a layer of refried beans, then the collard green mixture, and fold in half. Top with cheese. Place on the baking sheet and place in the oven broiler until the cheese has just melted. Remove from oven and set aside. In a large pan over medium heat, cook the eggs to “sunny-side-up” in the 2 tsp. oil or butter until they have set whites and runny yolks. 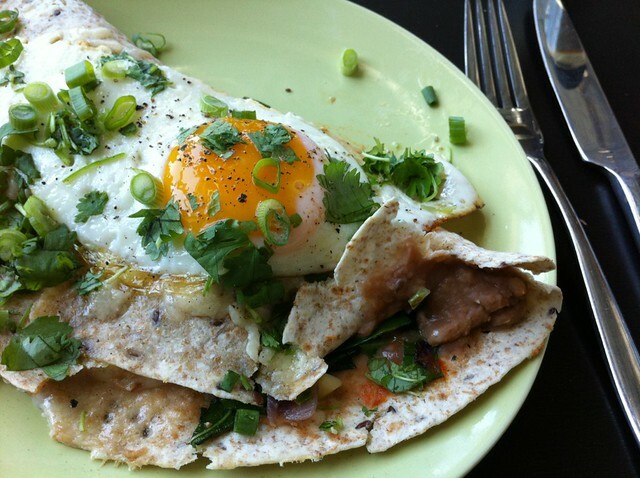 Top the stuffed & broiled tortillas with the eggs. Sprinkle with green onions & cilantro, and serve with hot sauce, salsa, yogurt, sour cream, and/or guacamole and enjoy tremendously. These look so good! Seriously. I just love tex-mex for breakfast too. Something about being able to eat guac and salsa first thing in the morning makes me really happy. Agreed! Guacamole on toast also makes for a great breakfast!! I’ll take any excuse for Tex-Mex! Thanks for this! I went there for Mother’s Day and my hubby ordered the huevos Monty and we’ve been dreaming about it since then. Also an update – the Out to Brunch book is available again at their location.